Let me say one thing straight off: I don’t pretend to be a connoisseur of chocolates. I don’t know a “single estate” from a “grand cru” (yes, yes, that’s how they talk about chocolates these days). The only gourmet chocolates I know about, and invariably gravitate towards at airport duty free counters, are Godiva and Valrhona. Or maybe, the odd Sprüngli. Yet I shall take my courage in both hands and declare that most Indian chocolatiers don’t get the stuff right. They. Just. Don’t. But you know what’s truly astounding? 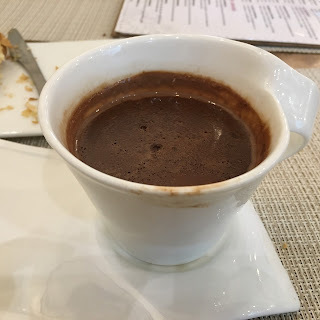 Most Indian joints don’t even get a cup of hot chocolate right! Now hot chocolate is a fairly simple concoction. It’s a mix of chocolate, hot milk and cream. It has one simple requirement — that the chocolate hit be strong enough for a mood-lifting and heartwarming experience. It can be a heavenly drink, especially on a winter day.